Hi I am currently making new chasubles. I have had problems avoiding having the linings droop because of the bias. I have cut the front and back U shape with the grain vertical and with seams at the shoulders. Do you have any suggestions on the best way to cut out the lining please? I have previously done it the same as the main fabric but wonder if cutting it in panels(3 or 4)with the grain through the middle of each panel piece may be better? Thanks for that,I had cut the lining about 1/2 an inch shorter, but obviously not enough, I will see how it goes with the next ones. 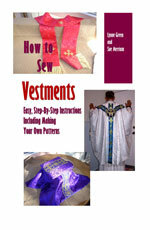 It sounds like you are cutting both the chasuble piece and the lining piece the same size. Instead, cut the lining piece an inch and a half smaller than the chasuble piece all the way around. Then, right sides together, pin the chasuble piece to the lining piece, at the shoulders and at the bottom in the middle. Now your satin is going to be shorter than the chasuble, so you will have ease the satin by stretching it as you stitch it to the chasuble piece. This will keep the satin from drooping.